Whether you are new to baking, or have been baking up sweets for years, you are going to fall in love with this simple, flavorful pound cake. Have you ever wondered where Pound Cake gets it’s name? I’m going to give you some fun trivia. You never know when this information might come in handy, haha. Pound cake first originated in 18th century Europe as a delicious, easy, and huge cake recipe that called for a pound of each ingredient: flour, butter, eggs, and sugar. That’s a LOT of pound cake loaves. However, the simplicity of these classic pound cake recipes (not to mention the amazing flavor) will ensure their popularity for years to come. Everyone loves a no fuss go-to cake recipe. No frosting or decorating skills required! The Pound Cake that I am sharing with you today is a family favorite! It is simple, has a nice even crumb, super moist, and the flavor is out of this world. We’ve been making this cake for years for special occasions or for no occasion at all! This classic pound cake recipe is delicious on it’s own, or dressed up with strawberries & cream or a simple glaze. The flavor is wonderful, and if you like a hint of lemon, I highly recommend adding a little lemon extract. We always do! 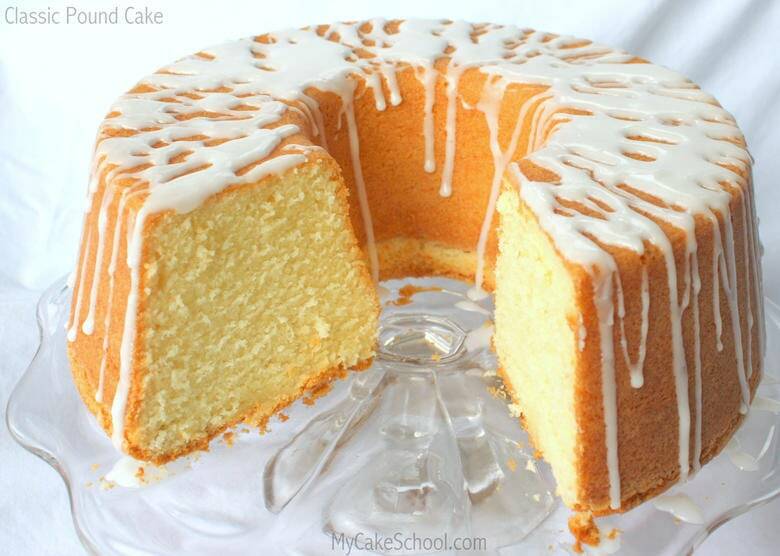 After baking our pound cake, we drizzled it with a Simple Vanilla Glaze. This quick glaze can be whipped up in minutes, and I just love the look! You can drizzle it by the spoonful, or pipe it through a disposable piping bag with the tip snipped away. Just have fun with it! In a separate bowl whisk the flour and baking powder to combine, set aside for later. Cream the butter with the paddle attachment in your mixer, gradually add the sugar and beat until light and fluffy 3 to 5 minutes. Add the vanilla and lemon extract to the l cup of milk. Add the flour mixture alternately with the milk to the butter, sugar, egg mixture. Begin and end with the dry ingredients. I add the dry 3 times and milk twice. Bake at 350 degrees for 1 hour and 10 minutes or until a toothpick comes out clean. **This is also the recipe that we use in our petit fours video! For petit fours, we pour into an 11x15 inch pan so that they are nice and short (approximately 1 1/4 inches tall). This is a really versatile recipe. We’ve baked this pound cake recipe into sheet cakes & sliced into squares for our Petit Four Video Tutorial. 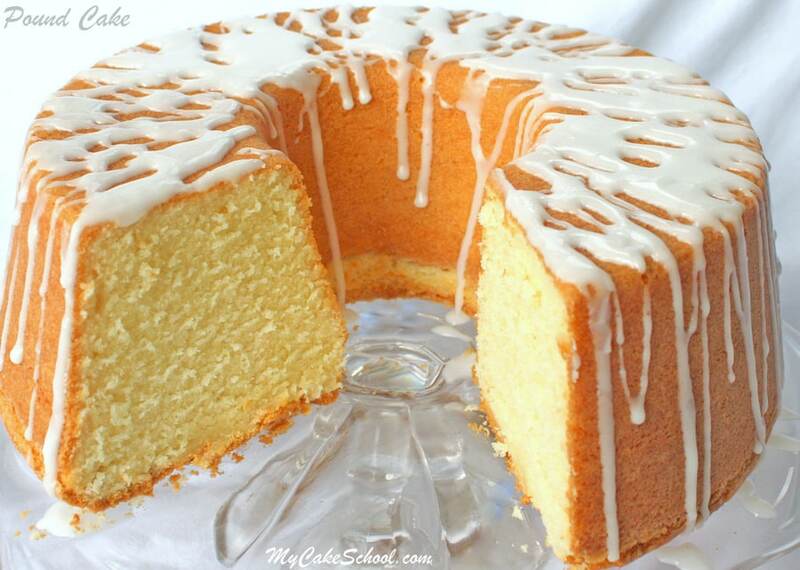 We have a few delicious pound cake recipes in our Recipes section that you just have to try! 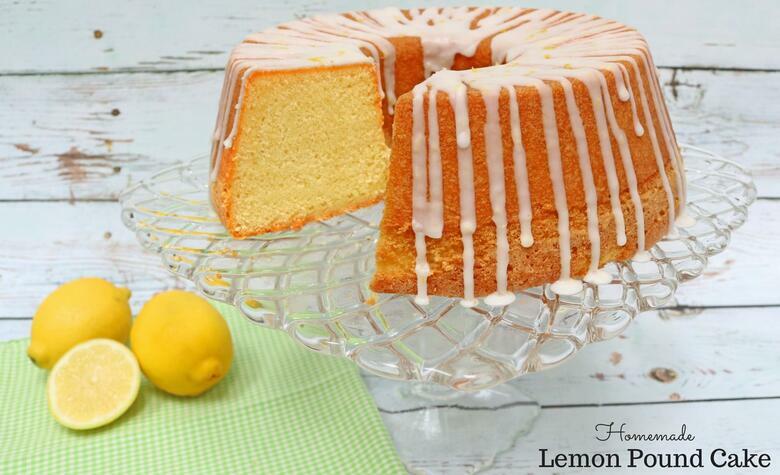 Aside from this classic pound cake recipe, we also LOVE our Lemon Pound Cake. You can never have too many delicious pound cake recipes! If you’re a fan of the flavor combination of Lemon AND Raspberry, you must put our moist & fruity Lemon Raspberry Swirl Pound Cake onto your list of cake recipes to try! The flavor is amazing! You can find it here: Lemon Raspberry Swirl Pound Cake. 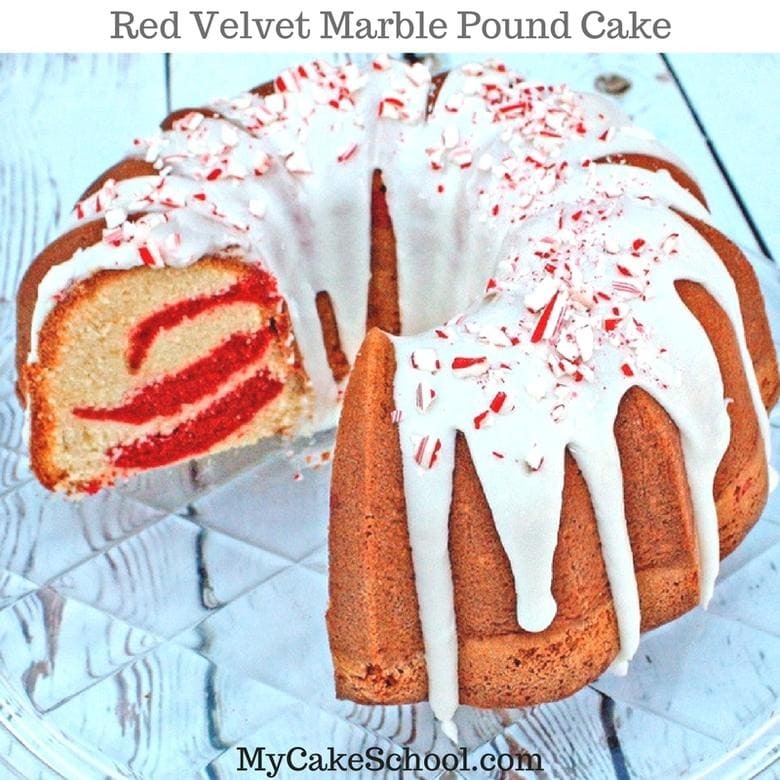 And finally, we love this amazing southern Red Velvet Marble Pound Cake year-round, but especially at Christmas (with a peppermint glaze)! It is beautiful when sliced and is SO flavorful! 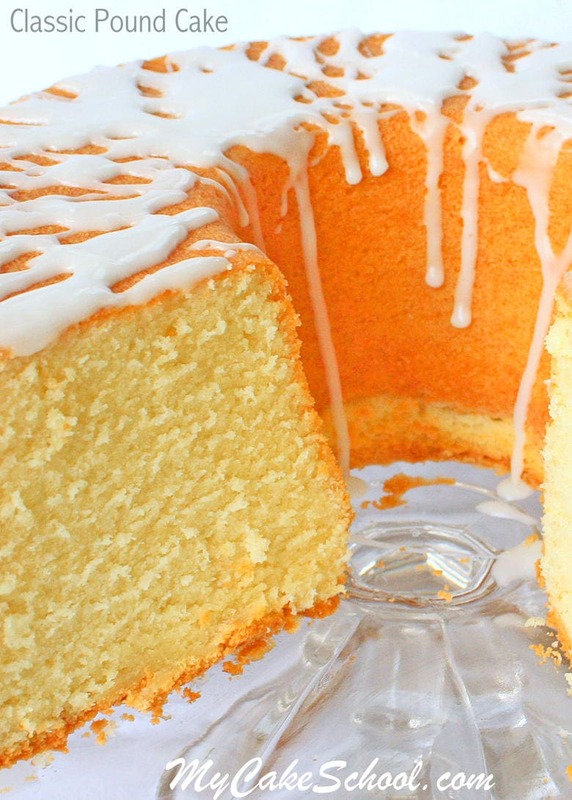 We hope that you’ll give this amazing classic pound cake recipe a try! Make sure to check out our Recipes Section for our entire collection of tried and true cake, filling, and frosting recipes! Thanks for stopping by! We hope you visit again soon! Hello, so I’m making this cake with lots of dried fruits in it next week. Don’t have a Bundt pan, will it work in a 10″ pan that’s about 4″ deep or will it be better for me to bake it in layers? **If you do not have cake flour, you can make your own using the following method. For each cup of all purpose (plain in the UK) remove 2 Tablespoons of flour and replace with 2 Tablespoons of cornstarch. For this recipe, there is 3 cups of flour so measure out the flour and remove 6 Tablespoons, then replace with 6 Tablespoons cornstarch, whisk to blend. Add flour mixture alternately with the milk, at this time also add the extract,lemon juice and zest. Begin and end with dry ingredients (3 additions of dry, 2 of wet). Blend after each addition just until ingredient is blended in…..Do not over mix as this could dry the cake. Pour into prepared pan and bake at 325 degrees for 1 hour and 5 minutes. Time may vary for your oven. If you find the top of the cake is becoming too dark, cover loosely with a piece of aluminum foil. The cake is done when a toothpick inserted come out clean or with just a few crumbs attached. Cool in the pan 15 minutes on wire rack. Remove from pan and let the cake continue to cool. Do you have the baking time if you use the 11×15 pan? Thank you! CONGRATULATIONS I MADE IT WOO……. IS THE BEST THANKS FOR SHARING THE RECEPI. Hi Maria, That’s great!! I glad you made it!! Thanks for posting! So awesome your sheet poundcake came out nicely.Ive been searching for the perfect recipe for a sheet poundcake.Also did you have to double the recipe .How high was your cake please?Thanks for sharing! Hi I am looking for a cake to make a trifle any suggestions. My husband’s grandmother asked for a pound cake for her birthday. I made her this one with a chocolate ganache glaze! She loved it and raved about it being the best pound cake she’d ever had! She has since asked me to make it again and again for her! Thanks for the great recipe! Hi Kristina, That is wonderful! It makes us happy to read that your grandmother liked the cake. Thanks so much for your post. 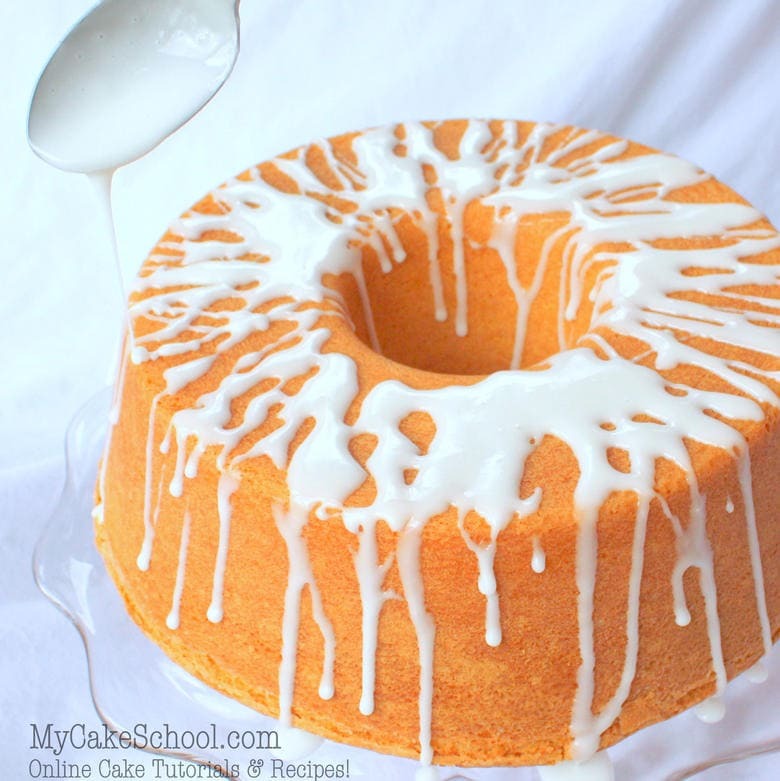 Can you make this in mini bundt cake pans? How long would it bake? Hi Barb, We have not bake this in mini bundt pans but you can. Keep the temperature at 350 degrees. I am not sure what size your mini bundt pan is but the cakes should be lightly brown and a toothpick inserted will come out clean. Also when you lightly press it with a finger the cake will spring back. If I’m using a regular size bundt cake pan will the temperature to bake be the same as the recipe states?? Hi Nikki, First, lower your oven rack to the next to lowest position and set the oven to 325 degrees. Most bundt pans have varying shades of dark finishes and this will cause the cake to bake faster So just check on it a bit sooner with a toothpick or a long skewer. If you find the top to be getting too dark, cover the top loosely with a piece of aluminum foil. How could you use this as a base for a spice pound cake with raisins and nuts? Hi Frances, We used Pillsbury all purpose flour (bleached) for the pound cake recipe. You could also use unbleached all purpose flour. This is the brand we always use for our cakes that use all purpose flour. We most often use cake flour for our layer cakes, Swansdown Cake Flour. Are these brands or something similar available in your area? I only have a hand mixer I would like to know will that work to make the pound cake? Hi Elvia, Yes, you can make the pound cake using an electric hand mixer. It will take just a bit longer mixing. When creaming the butter and sugar mix until it has lightened in color and has a fluffy look. Mix in the eggs until the yolk of the yellow disappears. When mixing the batter with the dry and wet ingredients mixing until the additions are blended in but don’t over mix. Hope all goes well.